The Fair and Square Quilt top has progressed to the quilting stage. I am going to quilt straight diagonal lines through the larger solid squares as well as some more concentrated cross-hatching through those blocks pieced from the much smaller squares. As usual I am marking lines with a Hera Marker. 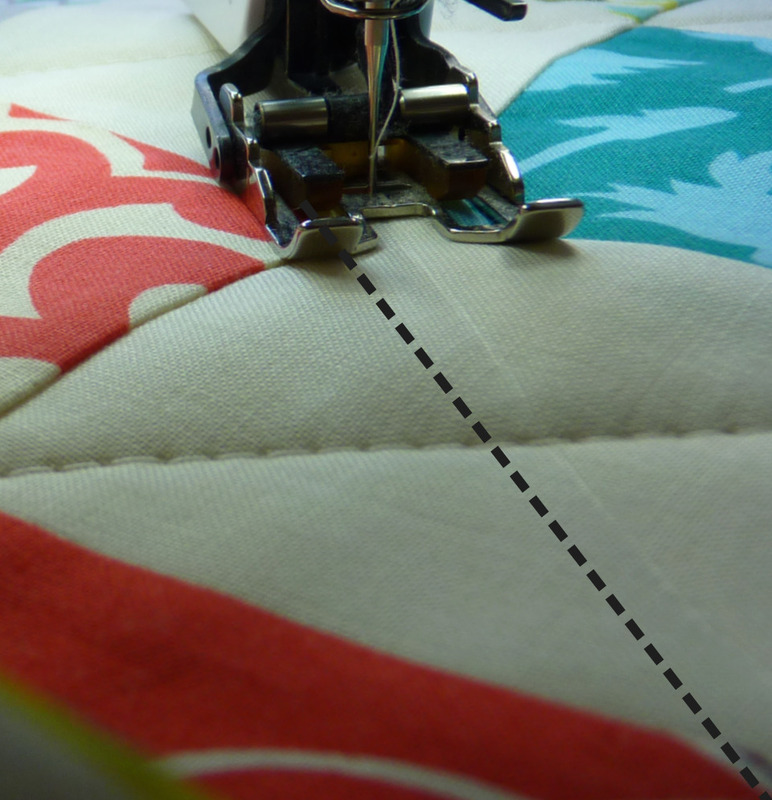 A Hera Marker marks a temporary faint crease on the fabric (as pictured above - just to the right of the - - - - - line) without any messy residue. Using a ruler I mark one or two lines at a time. The crease lines helps take the wobble out of my stitching and is obvious enough to follow accurately. I would be lost without it! Truly, after piecing overload last week, I just couldn't bear the thought of piecing a backing for this quilt. As it happens I found this large scale print on sale at my local patchwork store. The creamy/white background matches the solid Kona Cotton (Snow), used for the quilt top, perfectly. I hope you have a happy stitching day! Such a lot of work! Looks fabulous! I like your choice of backing print! I have a hera marker and have never used it successfully. Thanks for showing us what your crease looks like. Thanks for the Hera Marker tip...I didn't know it did this!! I use it for finger pressing...I can't wait to try this! It's certainly sewing weather in Melbourne today. Rain always makes me want to get crafty. Thanks for the tip on the marking tool. I'm going to track one down. I have a Hera Marker but wasn't sure if the crease was temporary or permanent so have been hesitant to use it (because I'm not very accurate with my quilting yet). I'll definitely be giving it a go on my next quilt! Yet another fabulous and inspired quilt. I always use a Hera marker. I started quilting in 1994 and used many markers, some with terrible results. So I wouldn't use any other. I love that backing fabric. It's exquisite. You know, every time I come here I learn something new from you and now I know how you get yours lines so straight - I thought you just had superhuman straight line power - next time I'm visiting my LQS I am going to buy one of those line markers - I never knew what they were for before. An odd thing happened last night - I have decided I need to learn more about putting colours together so I decided to go through people's faves and pick out things where the colour scheme caught my eye and worked for me and 9 times out of 10, it was one of yours! You are the queen of quilts and now also the queen of colour although your sister is clearly the queen of actual quilting with all those rosettes hanging round her neck! I always admire your straight quilt work. 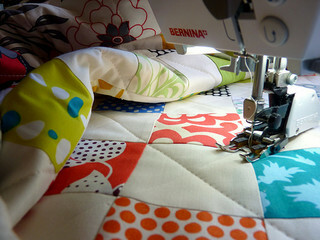 Great looking quilt - can't wait to see the finished results. Thanks for the marking tip. I will try it out next time. 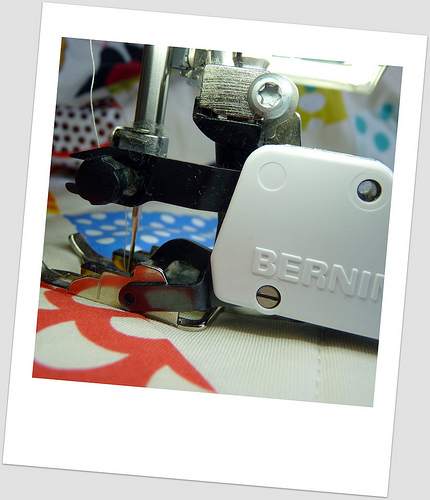 And it makes sense that it helps keeping a straight when sewing (always my problem)!! Looks amazing... cant wait to see it finished!! So excited to see the finished quilt! Rita - the backing fabric is gorgeous! Thanks for the tip on the hera marker too. I'm so glad to hear that someone else has a Hera Marker, I thought I was the only one! I love it. That backing fabric is perfect. Happy stitching to you too!! I'll have to look up a picture of a Hera Marker. I had not heard of this before and I liked how you used it. 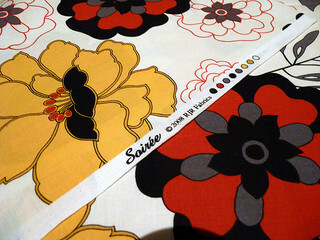 Nice backing fabric as well...it makes me want to go out and shop, but I never find such cute fabrics as I see on these blogs! Such ENVY!! !